Fantasy is one of my favorite genres. I love to escape our world for a moment and believe in the fantastical. However, my belief is only suspended so long as the world makes sense. World-building is crucial in any story, but especially fantasy and sci-fi. It’s a massive undertaking to create a full world with a magic system, governments, and history that feels real. So, how do you do it? World-building is a time consuming, complex procedure, that can be a lot of fun. Since there is so much to cover, I plan to split up the content over a few blog posts. This is a quick warning: I’m about to become a science nerd. My background is in biology and I’ve taught geology as well. Ignore Sheldon for a moment, because geology is crucial when it comes to your world. Worlds have to make scientific sense. The laws of nature will always exist, no matter what planet you’re on. Have two suns? Then your planet will have lots of desert. Have multiple moons? How does that affect your tides? Nothing is more distracting to me than worlds that don’t follow the laws of nature. Recently I read a fantastic fantasy, but within the first moments, I found two issues. The first was when I looked at the map. In this world, the rivers cut through the continent from ocean to ocean. The second was they had a version of the northern lights, but not at one of the poles. Both of those oversights pulled me out of the story. When I start to build a world, I draw myself a map. I do it by hand though I know others who use the computer and others who don’t have a map at all. I find maps helpful because I can see the obstacles my characters might have to face, know the climate of certain countries and be able to create their histories from it. There a few things I keep in mind when I create the details of the earth. Weather and climate can depend on the movement of water. They bring cold water down from the poles and warm water up from the tropics. Mountain ranges are formed where tectonic plates collide against one other. Tectonic plates make up the crust of our earth. They are always moving (why we used to have Pangea.) Their movement creates many different features along the earth. This is why you tend to see mountain ranges in line with one another. 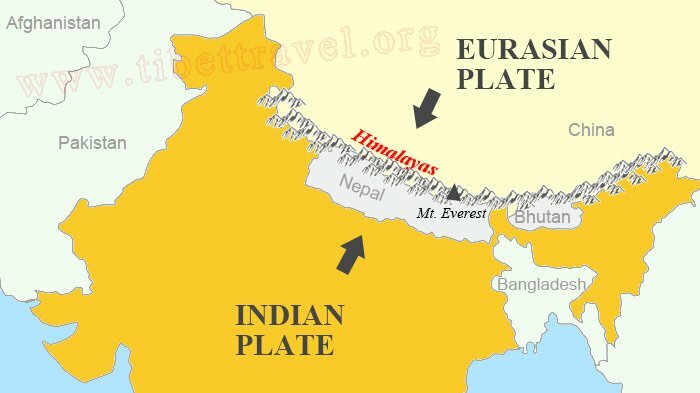 For example, the Himalayas are where the Indian plate meets the Asian plate. Mountains also affect the climate in the area. RIVERS DO NOT CONNECT OCEAN TO OCEAN. I just had to say that very quickly. Rivers are actually formed when snow and ice at the top of mountains melts, forming a small stream. The water runs down cracks in the earth. Soon other streams will meet with that stream and they will create a river. All rivers must run somewhere, either an ocean or a large lake. They cannot stop. They do not need to run south. South isn’t always downstream depending on the geography of your land. Islands are created in three different ways. The first type of islands are volcanic (Hawaiian islands). I already explained how volcanoes work, so it’s the same concept. The second type of islands form like the mountains, where two tectonic plates collide just under the ocean. The third type of island forms from deposits of sand leaving the mainland due to erosion. On our earth, most deserts are located around 30 degrees latitude. This is where we have a drop in moisture. Other deserts are near mountains. When air moves over a mountain range, it gets colder and can’t hold water as well which makes it rain and snow on top of the mountain. As it passes over the mountain, it becomes warm against and retains the ability to hold water, causing a desert below. Both freshwater and saltwater marshes are formed due to flooding of an area, either by a river or body of water. So, they need a source of water near them. Saltwater marshes can only be found by an ocean or sea, while freshwater marshes are found near rivers. The Northern lights are named such because they are only found near the Arctic Circle. The Southern lights are the same on our south pole. There are a few factors that affect the Northern and Southern lights, but the reason why they are located at the poles is because the Earth’s magnetic field is concentrated at the poles. Have you had a difficult time creating your world? What do you find helps? Any other features of your world you’d like to know about? Comment below! Dana this account of earthology is handy. I wonder though, for the sci-fi people out there, is it necessary for worlds elsewhere to always follow these same physical rules? (I’m revealing here how little I know!) I suppose if the planet had a similar atmosphere, and was habitable by humans without extreme measures they would be. Well, they’d have to follow some. Like if there was no moon, then there would be no tide. That’s something to research though! Fascinating overview of an often forgotten part of world building, Dana! Dana, this is great. I love the examples and visuals. It’s a reminder to me that I need to draw a map of my WIP even though it takes place in a “simple” Earth forest. Thanks for sharing. Dana, this is an amazing geography lesson – straightforward, clearly written, and filled with glorious color. I will DEFINITELY refer to this post when building my worlds.